I am following this recpie to make a lasagna (minus the ragu because jewish law) and I always wonder how to best layer the lasagna. 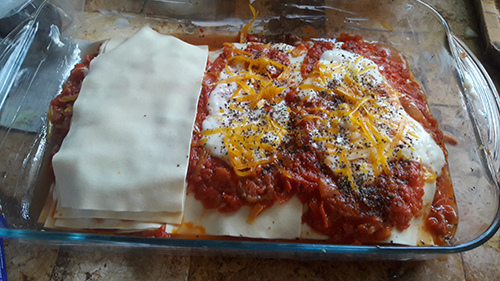 Below is a picture of how I layer my lasagna. Is this the correct way in terms of white/red sauce ratio, cheese and seasoning? Is it ok that the sheets don't cover the entire casserole? Traditionally, you start with a layer of pasta at the bottom, then go ragu-bechamel-lasagne-ragu-bechamel-lasagne, and finish with a layer of bechamel directly on top of the last pasta layer, followed by a liberal covering of grated parmesan. It is also common to add a sprinkling of parmesan on top of the bechamel in each layer. I find it better to have the pasta slightly underfill the dish than end up trying to tessellate fiddly bits. But this is all a matter of preference.